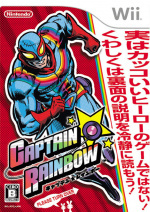 Captain Rainbow was one of the Wii's most original titles but sadly it never got localised for western release. While it's certainly possible to fight your way through the game without any knowledge of Kanji, a western translation is something fans have been holding out for for years - and it's now a reality. The patch - which isn't totally complete yet, we should add - is the work of MarkAss and it builds upon the work of the previous translation group, Kirameki. It's clearly a work-in-progress and MarkAss (what a name) is open to feedback which will improve the patch. Obviously there's a bit of jiggery-pokery required to get the patch running alongside the game (emulation on your PC via Dolphin is probably the easiest route), but it's well worth the effort. If you don't already own this unique Wii title then you'll be pleased to learn it's pretty cheap these days. Oh boy I wanna try this. Yes! I've been waiting for this, and I hope they finish it someday. From what I've seen, this is a very quirky game. It makes me think of Okami ! I always wanted to play this game. Tempted to get the Japanese version on Play Asia. Would this work on a UK console does anyone know? Interesting, I would've thought it'd cost more on Play-asia considering the game sold quite poorly in Japan. My main beef with the patch is the swearing. It's completely unneeded and just comes off as forced. If you absolutely must have swears just use symbols. That kind of thing reeks "unofficial." Jiggery-pokery. I see that tried and true Judge Scalia phrase will never die. @goldbricks23 Yes, but you need to mod it to remove the region lock. It's pretty easy, however, and you only really need an SD card (preferably 2GB or less for no compatibility issues). You should either have one lying around or get one for really cheap. @Oat It's more closer to how the first game was where you help around a house. @Parkour_LMan I've never modded anything before so I may just leave it. I do have spare SD cards but I wouldn't even know where to start. Thanks anyway, appreciate the reply. I've owned that game since it came out, and completed it in Japanese, without understanding much, but I'm glad now I can play it in English. I'll definitely be streaming that on Twitch in the coming weeks, especially since I'll be done with Super Mario Odyssey tonight. As I recall, this was kept in Japan, due to a mission involving clearing up Birdo's gender by finding her sextoy, & possibly also the devil from devilworld wanting to be the leader of Hell. Probably not so much the latter, as the former. Edit: Crazy Tracy from Link's Awakening, & Lip the fairy from Panel De Pon also are in this.